Stacie Ruth and Carrie Beth Stoelting are two sisters on a mission: to shine the bright light of Jesus to the world. As the founders of Bright Light Ministries, they believe that there is hope and salvation through Jesus Christ. 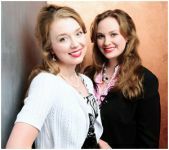 As recording artists, Stacie Ruth and Carrie Beth sing Christian, inspirational, and patriotic songs for audiences nationwide. The duo has recorded two albums, Heavenly and In God We Still Trust. They have sung for top leaders and they have appeared on FOX News, CBN News, American Family Radio, etc. Together, they infuse audiences with positive patriotism and faith in God. On a deeper level, the girls have experienced many painful trials as well. For example, they witnessed a violent, fatal accident that forever changed their lives. They prayed with the victim - a wonderful husband and father - as he bled to death. The experience awakened the sisters to the urgent need of evangelism. It also provided them with new insight and greater appreciation for veterans (who experienced far worse on the battlefield). Stacie and Carrie has experienced pain. But they have also experienced the healing power of Jesus Christ. On this site, you can find ways to hope and cope in the face of crisis. Discover tips, articles, music, and tools to help and inspire you. And, check out Stacie and Carrie's blogs for fun and encouragement. Learn more about Jesus' amazing love, mercy, and compassion today. Learn about Jesus here! In God We Still Trust captures patriotism, faith, and freedom and enraptures audiences with soaring voices of passion. Stacie Ruth and Carrie Beth appear as new leaders of the post-9/11 generation. Their three octave ranges combine with their passion for Christ and audiences feel motivated to move forward in faith! With powerful, heart-stirring songs, In God We Still Trust activates positive patriots of faith to hoist the torch of carrying God's brilliant truth to today's world. It will make you feel proud to be an American like never before! Grammy and Dove winners produced and played on their album, Heavenly. But it’s not a secular project: It’s meant for their Heavenly Father. "Heavenly" is not an album. It’s a worship experience. Need a depression-lifter? "Heavenly!" fits the bill. Carrie and Stacie say: "Heavenly! is not meant for earth or its awards. It’s dedicated to our Heavenly King Jesus." Do you know our Heavenly King – our Best Friend? CLICK HERE to get to know Him!" Heavenly is available nationwide (i.e. on Christianbook.com, Amazon.com, etc. ), but all copies ordered here fund outreach. How great is that?